HSP60 Implicated in mitochondrial protein import and macromolecular assembly. May facilitate the correct folding of imported proteins. May also prevent misfolding and promote the refolding and proper assembly of unfolded polypeptides generated under stress conditions in the mitochondrial matrix. Specificity: Antibody can detects endogenous HSP60 protein. 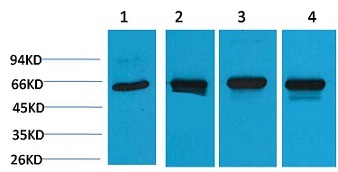 Western blot analysis of 1) Hela, 2)3T3, 3)Mouse Brain, 4) Rat Brain, with HSP60 Rabbit pAb BE3319 diluted at 1:2,000. Immunohistochemical analysis of paraffin-embedded Mouse Kidney Tissue using HSP60（BE3319）Rabbit pAb diluted at 1:500.